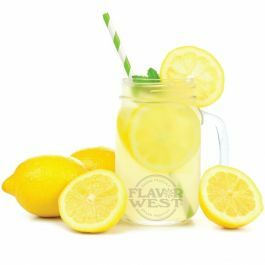 Natural lemonade flavor creates flawlessly refreshing lemonade taste. Use lemonade flavor to add exceptional taste and scent to baked goods, pastries, yogurt, sorbet, gelato, ice cream, and more. Great for adding flavor and aroma to your craft treats. No artificial sweeteners. Please Note: Flavor is highly concentrated (Shake well before use). Type: Lemonade All Natural Water Soluble Flavoring. Ingredients: Natural Flavoring, Triacetin and Ethanol. USP Kosher Grade Flavoring. Usage Rate: 15-20% for E-use. Flavor suitability: Baked goods, pastries, yogurt, sorbet, gelato, ice cream, drinks and much more. Specific Gravity: 1.05 No Refunds on Flavoring. This is a perfect lemonade. It is sour and tart with mild hints of natural sweetness just like fresh squeezed lemonade. It is NOT a coil gunking nightmare like some other lemonades, it does not require any sweetener to be great but can be sweetened to make less bold. I tend to be one who prefers sour/tart rather than sweet. This is awesome! The one thing about this flavor that I would warn is that if you're using a dripper...do NOT let the wicks get dry. If you've ever scraped lemon zest (the white part of the lemon rind) with your teeth, that's what you'll get with this if you don't keep your wick wet and get a semi-dry hit. If you're like me and prefer the sour rather than the sweet, you'll really appreciate this flavor. I love the Pink Lemonade flavor too.